Flemming Funeral Homes, Inc. offers families the option of funeral preplanning. “Preplanning," also known as “prearrangement," or “prearrangement planning" simply means that you set up your funeral arrangements in advance of the need for these services. Flemming Funeral Homes, Inc. can help you set up a preneed contract. It can be prefunded through life insurance or a bank trust. What is involved in preplanning a funeral? 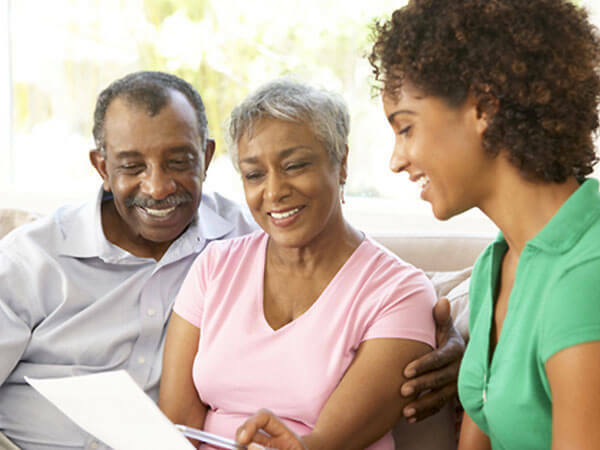 Preplanning your funeral can be as simple and informal as the act of writing down your preferences and sharing your wishes with a family member. If you want to make more formal arrangements, Flemming Funeral Homes, Inc. can assist you with setting up a preneed contract that outlines the type of service and events you want for your funeral. We work with you to make sure you understand all your options. We help you to select only the services you want. We also offer several prepayment options to help you control future costs. There are several advantages in taking charge of planning your own funeral or memorial service. It lets you make your wishes known, so your loved ones won't have to guess. They won't have to worry if they did the right thing. It eliminates emotional overspending from grief or guilt. Prearranging can bring peace of mind to your family's decision-making. It relieves your family from the strain of making at least one set of decisions during a very emotional and stressful time. It gives you a chance to personalize your funeral service and makes it a "celebration of life." It's a way to get your loved ones involved and make it a positive experience. It relieves you and your family from future financial responsibilities and burdens. It gives you total peace of mind. Preplanning your funeral is a thoughtful gift you can leave your family. Preplanning allows you to control the cost of your arrangements and offers options to lock in prices in advance of the need for services. If you elect to pay for a funeral service in advance, the price of the services and merchandise are guaranteed. You are essentially paying for a funeral service at today′s price, even though the need may not occur for many years. Through our preplanning program, you can be assured that your money is safely in trust and will be available at the time of need. A prearrangement plan is portable. If you need nursing home care or other monetary assistance in the future, your prefunded service cannot be taken away from you. Yet if you move, your arrangements can move with you to the funeral home of your choice. You have flexible options to fund a prearrangement contract. We offer you the option of setting up either a revocable or irrevocable preneed contract. The term "revocability" refers to the prefunding of your funeral. Preneed contracts can be either "revocable" or "irrevocable." A revocable contract can be cancelled or "unfunded" at any time, and the released funds can be used for any purpose. An irrevocable contract must be used solely for the purpose of paying for funeral expenses. Most people choose to make their pre-funding irrevocable because they want to ensure that the money will be there to pay for their funeral in the future.